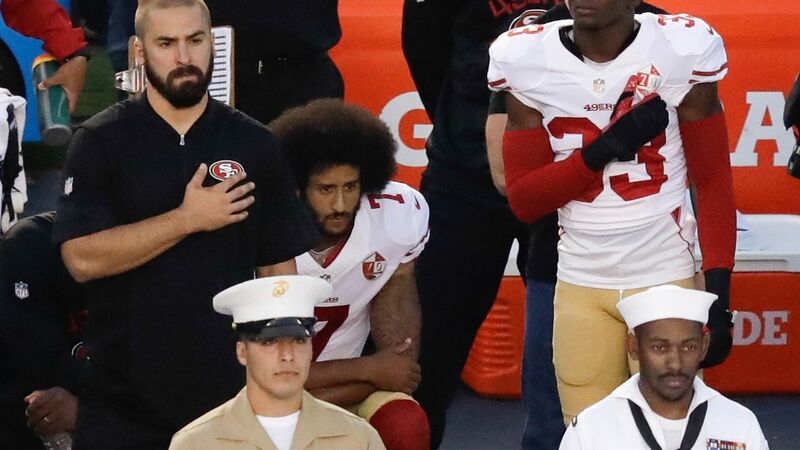 NEW YORK (WABC) -- A lightning rod for controversy, the first player to take a knee in support of the Black Lives Matter movement, Colin Kaepernick is the nation's most famous unemployed football player. Monday night, he's filed a grievance against the NFL claiming collusion, not with Russia, but among the 32 NFL owners, to keep him out of the game. The former 49ers quarterback played six seasons with the team and even took them to the super bowl. But at least 35 others have been signed since he last played. So Monday morning, his lawyers alleged certain teams wanted to sign him, only to "mysteriously go silent with no explanation." President Trump set fire to the debate last month, and has only doubled down since then. On Monday, he was railing against the NFL in the rose garden. "The people of our country are very angry at the NFL, all you have to do is look at their ratings and look at their stadiums," President Trump said. "You see empty seats where you never saw them before."